I am sitting on my front porch with a cup of coffee, watching the sun set on the brick building in front of me. The sun behind me, and the world is a beautiful place, filled with red and yellow and gold. My chair is comfortable, my coffee is good. The dogs are sniffling around the front yard. I can hear the sounds of children, in those last few moments before the call to come in for the night will go around the neighbourhood. It was a busy week of travel and meetings, it was a busy Saturday of errands and household things, and I have this brief time – with nothing but to sit and enjoy, watch the changing of the light. They call this the magic hour. What is grief, but a form of magic, I ask you? What is the terror and the pain and the horror that I found myself in four years ago, but a form of magic, a spell, an incantation that was thrown over me? It is easy to imagine the vile and loathsome creature that took my son away from me – it is easy to think of a cave, a foul smell and the guttural words of a spell. That seems as good and as reasonable an explanation of any about why tragedy struck me, struck mine, struck you and struck yours. Magic, all around us. Old order magic with no waiving of hands, muttering of incantations. Magic, hiding in plain view. Magic that is good and magic that is so terribly evil it is impossible to behold. Magic held into balance, just barely. And it seems a reasonable explanation that the magic of that spell would slowly wear off, that I would be able to find my way in the world. I look the same as I did back then, more or less, I walk and talk but I am utterly changed. See? Magic. I believe in goodness and mercy, all the days of my life, in spite of what happened. Perhaps I believe more strongly now. See? Magic. And on my front porch, watching the liquid line of gold fall towards the ground, I can be captivated by sudden and ephemeral beauty. See? Magic. Grief then a form of magic. It seems appropriate to think that – the best explanation. So much of our world seems fragile, improbable. The quickness of the life and death, the peace of a Saturday night sunset. The curve of my son’s ear, the way his finger was crooked just like mine. See? Magic. And this. The world I live in now. This wholeness and this peace that I find has come over me. My contentedness and my delight in beauty. I wouldn’t have believed it possible. See? Magic. It is customary, at the end of a Glow Post, to ask a series of questions. This is my last post on Glow, and I would beg your leave to simply say thank you. It has been an honour for me to write here. I thank you that you read. I wish you comfort, and when you are ready for it, magic. It’s hard to think about tradition without thinking about family. It’s hard to think about tradition without thinking about your parents and it is impossible to think about tradition without imagining handing down your traditions to your children. I don’t, to be perfectly frank, have much of a family. My mother and I are, at least for the present, estranged. Whether or not that estrangement will end and if it will end is up to her. My other family is in BC. I have no siblings. All of this makes holiday tradition ever harder. It often feels like I have to create a new community for each occasion. Without children, I confess, I feel lost at Christmas. Without children I wonder if I look pathetic as I decorate the house and plan meals. I like the Eggs Benedict Christmas morning, I like the prime rib with Yorkshire pudding. I like the stockings, I like the tourtiere. You could write my epitaph thus: She prepared a lot of food and there was no one to eat it. I wanted a large family that did the same things with every year. I wanted to have the same faces around the Christmas table, many faces. What I wanted, or at least what I thought I wanted was for things to never change. I thought if I didn’t have to build my own community each holiday, if my community was built in, then holidays wouldn’t be so hard, so lonely and feel so futile. I thought, by having children, I would have frozen Christmas into a perfect snow globe for all time. Flickr Ali 505Except, that’s not what life does, that’s not how families work. That’s not even how traditions go. There are no snow globes of tradition, except those we create in our imagination and memory. That's why we dream about tradition - because we can create perfection in our imagination or in our memory. We have no such guarantees in our forward-thinking life. It is possible, even likely, that I could have had 4 children and spent Christmas thirty years hence all alone. Age, birth, death, marriage and divorce change our traditions. We bring in new ones, we toss out old ones. I can change my thoughts on tradition. I can ease up, I can be more flexible, but that belies a single truth: I don’t want to be more flexible. I don’t want to have to give up the notion of tradition and I certainly don’t want to give up on the snow globe of perfect imagination. I wanted to hang on to all of this. I wanted to pass this on to my children. I wanted to tell them that I ate Eggs Benedict every Christmas morning for all of my life and they should too. I wanted stockings, overflowing with goodness, carefully placed on their beds while they slept. This year I looked at what I thought that perfect snow globe would be, what I really wanted and I realized it is not possible. 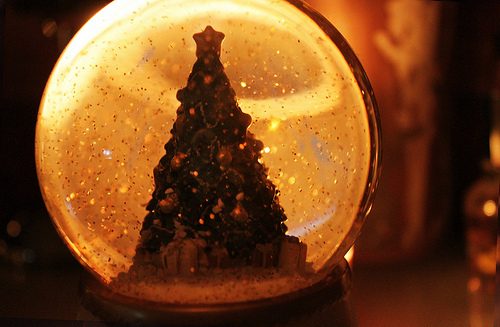 My snow globe will always be missing something – someone. In the middle of the snow globe, mixed in with the snow is a heavy dusting of grief. This year, the fourth year after Gabriel’s death, I am finally seeing it. Grief at Gabriel's death, at life with no children swirls around the holidays because it pervades our traditions. And maybe that’s where the struggle really lies. Maybe the need to examine the traditions I continue, maybe the frustration at creating my own community for every holiday really comes from this: they are but a remembrance of what I don’t have and what I can't do. Without living children I am powerless to create that perfect snow globe. Anything I can create, through what traditions I maintain, through what community I can build will never match to what I imagined. Tell us: How have your traditions changed? Do you approach the holidays the same way? What sort of community do you include now? How did Christmas go for you? I remember him. He is with me – a mostly weightless load now. He reminds me of what was going to be and what wasn’t. He is the future I thought I would have, the person I thought I would be. Now we are two separate galaxies, orbiting each other. We move in synchronous orbit most of the time, aware of each other and living our separate lives. A few times a year we meet in near orbit. Never quite touching, but the could have been becomes close enough to what is, causing an almost singularity. Sometimes the crash is soothing – I feel him more closely. Sometimes, like all space events, the result is dust and light and heat and brokenness. The orbits have fixed points: times in the year when we come close to each other and I plan for them: readily watching for a galaxy I can visualize with a naked eye. Other times I stare in the sky looking and unable to see him. I shrug my shoulders and decide that he must be at apogee orbit – the furthest away from me he can be, travelling slowly. I am a woman at an offsite meeting, with pumps and pearls and we are standing outside the board room on a break. We are chatting, these new colleagues of mine and I. I don’t know how the topic turned to midwives. On our team, one of the guys is married to a midwife and one is the son of a midwife. That’s about the only explanation I have about why we should be a team of analysts, talking about childbirth. In those uncertain days after Gabriel’s death, I talked about him. I talked about him to everyone. Objects in orbit move slowly at apogee – at perigee, where they are close to us, they speed up. I knew those moments would be quick and I thought the force of remembrance and words could slow the orbit down – keeping him closer to me for longer. I know now that there is nothing that can act against the force of geosynchronous orbit. He must needs move away, hitting apogee so that he can come back to perigee. I did not tell them it was me when I talked about high risk pregnancies. I did not tell them about my son, I did not tell them about the stroke, about almost dying. I did not tell them of the small bouquet of flowers at a funeral 4 days before Christmas, from mummy and daddy. I did not tell them about being alive when you most want to be dead. I referred to another woman. I hid who I was. At this point – this point of far-ness in orbit, he is not there for anyone to see. He is a fleck against a pitch black sky; far away and moving slowly through the cold. I cannot explain to someone who is not accustomed to looking. I cannot move their eyes, talking in arc seconds to describe his path. I cannot say, I think he’s out past the Kuiper Belt, in amidst the asteroids just past Pluto. You can’t see him, but he’s there and he will come back to me. I am the woman before you, in her pearls and black suit. I am the woman talking about risk and cost-benefit analysis, with a black berry on her hip. I am exactly as you see. I am a childless woman. When we are far apart I am nothing more than what you see. It’s just this: sometimes you might see me turn towards the stars. I look at the sky, turning my face to the darkness. He is far away at that moment, too far to see with naked eye. It’s ok. He is coming back to me. Do you find you ever feel like you are 2 separate people? Do you ever hide your child, or at least choose the times you talk about your baby? Do you map your journey through the year almost as an orbit? And do you find that you are more easily able to let your child go, knowing that they will come back to you in certain times and places?